Just over a decade old, the Iran Watcher program is an organizational model for remote diplomacy and a benchmark for success. There are definitely some advantages to working on a country with which the United States has no diplomatic relations. For instance, you never have to deliver demarches to bored second secretaries at the Ministry of Foreign Affairs, or attend tedious National Day receptions. The obvious challenge, however, is how to make sense of a country where we have no access. Given our national security concerns regarding some of Iran’s domestic and external activities, the State Department has a duty to our president and to our nation to help address this challenge. We owe decision-makers the most credible assessments of political, economic and social realities in Iran, as well as our most considered policy recommendations. The history of our rupture of relations with Iran is well known, stemming from the 1979 Islamic Revolution and the subsequent hostage-taking of 53 U.S. diplomats who were held for 444 days. Ever since then, the diplomatic model we have used in Iran is in many ways the mirror image of the one we followed for 53 years in Cuba. We send no official Americans to Iran, but do not obstruct the travel of unofficial Americans beyond warning them of the potential risks. In Cuba, we have official representation (via a U.S. interests section) but restrict private travel by U.S. citizens. The Swiss ably represent our interests in Iran, but are no substitute for our own political and economic reporting officers. There is occasional talk of trying to reopen some kind of U.S. office in Tehran, but I doubt the Iranian government will allow that to happen any time soon—even though it has its own sizable interests section in Washington and a mission at the United Nations in New York. 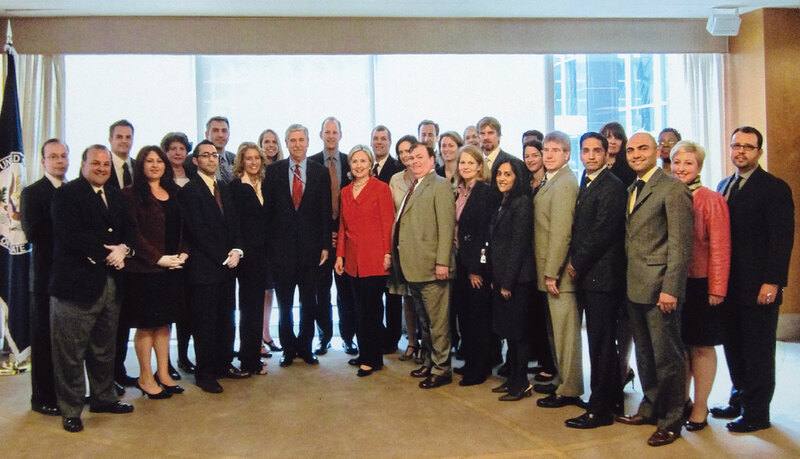 The State Department’s Iran watchers at a gathering in Washington, D.C., in 2010 with Secretary of State Hillary Rodham Clinton (center) and Deputy Assistant Secretary of State for Iran John W. Limbert (to her right). Author Jillian Burns is to the left of Clinton. Violations of human rights in Iran, including the repression of women, religious minorities, political activists and journalists. The effectiveness of any policy depends on the quality of the information on which it is based. The classic example of miscalculation due to misinformation in our post-1979 Iran policy was the Iran-Contra affair. Proponents of that secret deal argued that the United States could help empower “good guys” within the Iranian political system, but the plan quickly fell apart because it was based on faulty assessments of the internal political situation. Some American political careers were ruined, and public mistrust of the U.S. government grew as a result, but it didn’t lead to war. After 9/11, however, the risks of miscalculation grew exponentially. The State Department had long depended on its diplomats in Dubai for some coverage of Iran, given the significant bilateral trade between the two countries and the large Iranian expatriate community living there. The Bureau of Near Eastern Affairs created the first formal overseas Iran watcher position in 2002, assigning fluent Farsi-speaker Alan Eyre to the slot in the United Arab Emirates. The obvious challenge, however, is how to make sense of a country where we have no access. While the lack of posts in Iran would appear to stymie a career as an Iran expert, there are numerous opportunities for Foreign Service personnel to develop and use Iran-related expertise. In Washington, State Department offices with an interest in Iran include NEA, International Security and Nonproliferation, Economic and Business Affairs, Energy Resources, Counterterrorism, International Organization Affairs, Mission to the United Nations, Policy Planning, Educational and Cultural Affairs, Public Affairs, Intelligence and Research, Consular Affairs and Democracy, Human Rights and Labor. Several former Iran watchers have served as advisers to the Deputy Secretary and under secretary for political affairs. Outside State, Foreign Service members with Iran experience have served in related positions at the National Security Council, the National Intelligence Council, the Department of Defense and the Voice of America. Overseas, there are multiple opportunities as watchers, including the IRPO unit in Dubai, where the senior Iran watcher overseas is an FS-1 position. In terms of follow-on assignments, Iran expertise is useful at many posts, including multilateral offices. And Afghanistan and Tajikistan offer opportunities to serve in countries with languages related to Farsi. Many claimed to speak for the “Iranian people,” arguing that the Iranian population would support U.S. intervention in their country and would see any engagement with the government of the Islamic Republic as betrayal, legitimizing an entity that was supposedly close to implosion. What was not clear, however, was on what basis anyone could claim to speak for public opinion in Iran. Meanwhile, Tehran refused to be sidelined, as it watched the U.S. presence in its eastern and western neighbors growing. While some in Iran are probably grateful that we targeted two of the country’s biggest enemies, Saddam Hussein and the Taliban, others, including many within the regime, view the United States as a far greater threat. In 2005, I replaced Alan Eyre as the sole Iran watcher in the field and learned firsthand the challenge of trying to produce credible reporting with such limited access to Iranians. Outside the context of negotiations and multilateral settings, U.S. officials, including the watchers, have long had a policy of no contact with official Iranians. Given the possible repercussions of meeting with a U.S. official, private Iranians were rightly apprehensive about such contact. Still, I found that Iranians were eager to address the many misconceptions the West had about their country. Many I met were deeply unhappy with governance in their country, yet the bloody backlash to their 1979 revolution—including internal purges—and the horrific war with Iraq in the 1980s left them afraid of any kind of violent or abrupt change, preferring organic evolution. Their fears were compounded watching the declining security situation in both Iraq and Afghanistan, particularly as media speculation about possible direct military strikes against Iran’s nuclear program spiked roughly every six months. Some thought change must be led exclusively from within Iran, while others thought the United States could play a supportive role in bringing about reform. I also saw that the spectrum of political thought inside Iran was much broader than I had imagined. In some ways—particularly while President Mohammad Khatami was still in office—the status of women and the media within civil society, and economic diversification, were farther advanced in Iran than they were in many of our allies in the region. Then, I had to bear witness as his successor, Mahmoud Ahmadinejad, set back progress substantially, from which Iran has yet to recover. Throughout this time, I made clear in all my reporting to Washington that my access to Iranian society was extremely limited, so I could not document public opinion in Iran in any scientific way. While Iran watchers are not directly involved in sensitive nuclear negotiations, they represent a critical feedback loop for policymakers. Acknowledging that our Iran interests merited greater resources, in 2006 the State Department announced a broader Iran Watcher program. In addition to the new Iran Regional Presence Office in Dubai, Iran watcher positions were created elsewhere in the region and Europe to engage both Iranians and third-country nationals, including host governments, on Iran. Besides improving our understanding of the country, there was a second goal: to develop a new cadre of Iran experts and Farsi speakers to prepare for the day when we would reopen our embassy in Tehran. There are few U.S. diplomats left in the Foreign Service who have ever visited Iran, let alone served there. In that regard, Iran has an advantage over us; its United Nations mission in New York serves as a de facto embassy and gives some Iranian officials direct U.S. experience, even if they are limited in their ability to travel outside of the New York City area. Over time, the Near East Bureau's Office of Iranian Affairs has moved some Iran watcher positions from post to post, in search of the places with the maximum benefit. Administratively, these positions are challenging for State’s bureaucracy, as many require cross-regional bureau coordination, with officers sometimes having two chains of command. NEA oversees the program; IRPO does not manage watchers in locations outside Dubai. While there are many challenges, including dealing with host-country sensitivities to Iran-related work, overall, the program should be considered a success. While it is difficult to prove, I believe that over time, Iran watcher assessments have successfully challenged the faulty conventional wisdom about Iran that had been circulating in Washington since the 9/11 attacks. The watchers were also able to compile more accurate assessments of economic and human rights conditions, compensating for the unreliable data put out by the Iranian government. As a result, our policies came to demonstrate a more sophisticated understanding of Iran, including where our two nations’ interests intersect and where they diverge. Just like diplomats at any post, Iran watchers do not just report on developments and trends. They also advocate U.S. policy. Although they do not directly communicate with Iranian officials, Iran watchers address misunderstandings and challenge the regime’s deliberate mischaracterizations of our policies. This was generally done on an interpersonal basis until 2013, when the department approved a long-standing request to create an official Farsi-language spokesperson position. That official, currently based in London, has authorization to engage, in close coordination with Washington, the Iranian media and to post in Farsi on social media. While Iran watchers are not directly involved in sensitive nuclear negotiations, they represent a critical feedback loop for policymakers. They inform Washington of reactions, both by Iranians and others, to our public positions; and they track and assess the impact of Iran-focused sanctions imposed by the United States, European Union and United Nations. In an effort to expand mutual understanding, the department also tasked IRPO in 2006 to launch a reinvigoration of our official exchange programs with Iran, particularly the International Visitors Leadership Program. Iran reacted predictably, demonstrating its deeply ingrained paranoia that everything the United States does masks an intent of regime change. In 2008, it arrested several people connected with exchanges, despite the clear intent of the program to provide a platform for exchange of best practices in areas of mutual interest, such as health. Nonetheless, we have managed to continue some cultural exchange programs, to the benefit of both countries. Prior to the Iranian Revolution, Iran was one of the top-ranked countries of origin for foreign students in the United States. That number plummeted through the 1980s and 1990s; but after U.S. efforts to eliminate roadblocks, many of which were identified by Iran watchers, Iran now ranks 22nd among countries of origin for foreign students. There are few U.S. diplomats left in the Foreign Service who have ever visited Iran, let alone served there. In addition to setting up a Farsi-language online advising program, in 2011 the State Department unilaterally extended the validity of student visas for Iranians from three months/one entry, to two years/multiple entry. This occurred after years of reporting by Iran watchers that the limited visa was actually eroding students’ ties with their home country, because students were afraid to go home over the course of their study and risk not getting another visa. Iran, of course, is not the only place where we do not have a diplomatic presence. The department has used a different diplomatic model for North Korea, led by a special representative, and is adapting to new challenges like Syria and Libya. But the Iran Watcher program is a possible model for conducting remote diplomacy, despite some drawbacks. One disadvantage is the lack of an ambassador-level voice from the field in policy deliberations in Washington. Second, the limited career options for Iran experts make it more difficult to institutionalize expertise. While it is possible to follow Iranian developments from a variety of angles (see sidebar, p. 24), including at the National Security Council and on the seventh floor of State, the lack of an embassy and consulates diminishes somewhat the attractiveness of specializing in Iran issues. Moreover, serving as a watcher in non-Farsi language posts with only limited opportunities to speak Farsi makes language retention difficult. Clearly, then, this kind of nontraditional diplomatic work requires case-specific adaptation and training. Toward that end, the Foreign Service Institute is beginning to study the logistics of conducting diplomacy in countries where we lack a presence, with the aim of teaching this tradecraft to our diplomats. Some of this training can also be useful for diplomats serving in countries where we maintain an embassy but have reduced mobility because of security concerns. After the fact, I realized that I had applied lessons learned during my stint as an Iran watcher while serving in western Afghanistan from 2012 to 2013, as we sought to cope with a shrinking diplomatic presence in the country. Admittedly, it helped that we had a fairly systematic glide path of military base closures around which we could plan, rather than having to draw down rapidly in a crisis, with little warning, as is more often the case. When I joined the Foreign Service in 1993, the State Department had recently opened posts throughout the former Soviet Union, where we had never had a presence before—I didn’t know where half of the posts on my first bid list were. Meanwhile, we were closing posts for budgetary reasons around the world. Our diplomatic map will continue to shift due to security and budgetary conditions, but we must always be prepared to cover areas where we have no direct access; the quality of U.S. policy decisions depends on it. The Iran Watcher program can serve as both an organizational model for remote diplomacy and a benchmark for success. 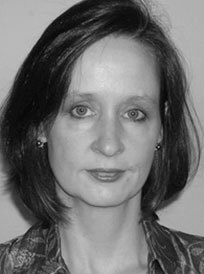 Jillian Burns joined the Foreign Service in 1993 and spent most of her career as a political officer working on the Middle East, particularly Iran. She served as an Iran desk officer and Iran watcher, and was the first director of the Iran Regional Presence Office in Dubai. She has also served as acting director of the Office of Iranian Affairs in the Bureau of Near Eastern Affairs, an Iran issues staff member in the Office of Policy Planning, and the first National Intelligence Officer for Iran at the National Intelligence Council, within the Office of the Director of National Intelligence. Other assignments include consul and senior civilian representative in Herat, Afghanistan, and director of the Near East Affairs Office in the Bureau of Democracy, Human Rights and Labor. Burns retired from the Foreign Service in November 2014. The opinions and characterizations in this piece are those of the author, and do not necessarily represent official positions of the United States government.